We are making noise in Homer Babbidge! 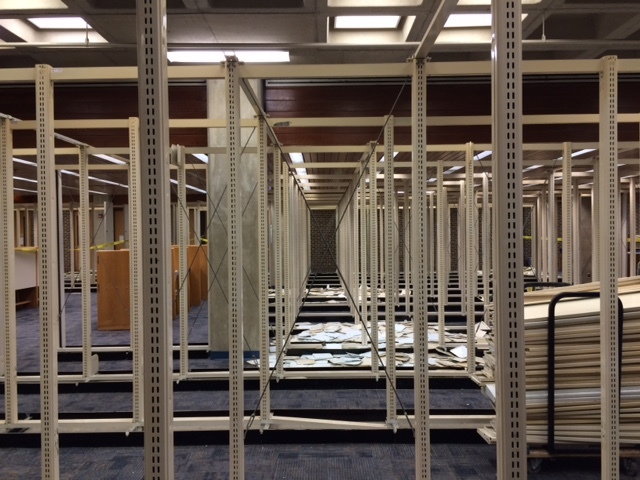 With a little help from UConn, we are finally able to take down all of those empty shelves on Level 3! 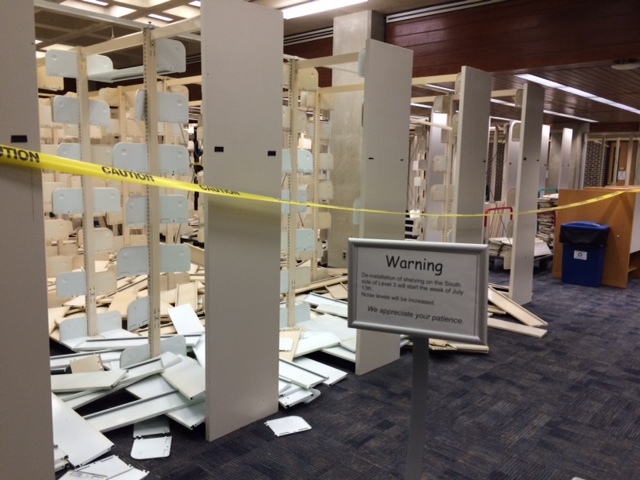 Once they are down we will need to fix the carpeting and we should be done by next week. Have you heard us mention that we will have a new search feature and wondered what it’s all about? Powered by ExLibris Primo, our search tool allows you to search and retrieve local and remote resources such as books, videos, and journal articles. The tool combines separate systems into one convenient search box, enabling you to access our books, electronic materials such as ejournals and ebooks, and Connecticut Digital Archive (CTDA) materials all in one place. This new system will not only better integrate our resources, but provide results that are returned quickly, in an easy to read format, and in real time. New features include a virtual browsing option that shows you the items next to yours on the shelf as well as information on multiple versions of the same material available. The system also searches the Primo Central Index. 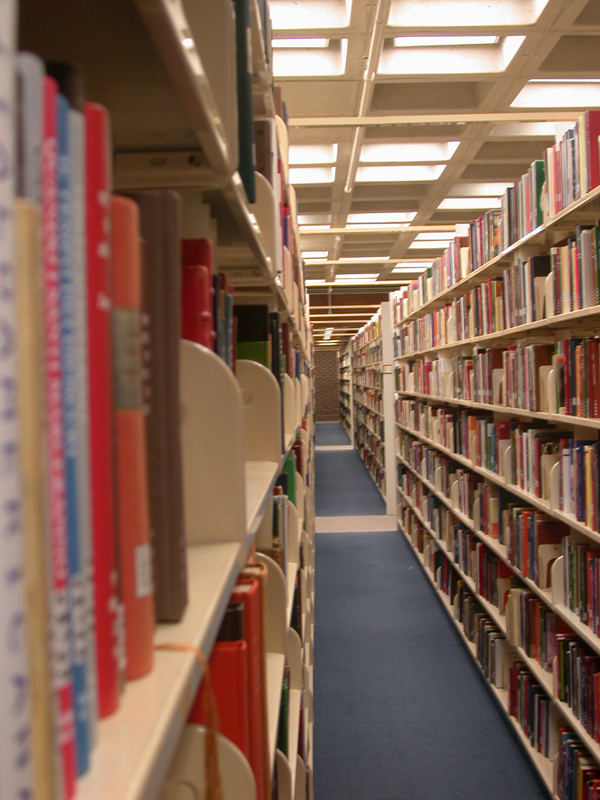 This currently holds over 900 million resources that can be requested through our interlibrary loan system. Over the next year, our search will also allow us the ability to integrate the resources found at UConn’s School of Law and Health Libraries. The switch will take place on Monday, July 13 and does not affect the current system for searching databases, interlibrary loan requests, and course reserve requests. The search feature is one piece of a larger migration of our library management system in the background called Alma. We won’t dive into the details on that but what is important to know about that is that Alma will provide more efficiency for staff behind the scenes since Alma also integrates several legacy systems. 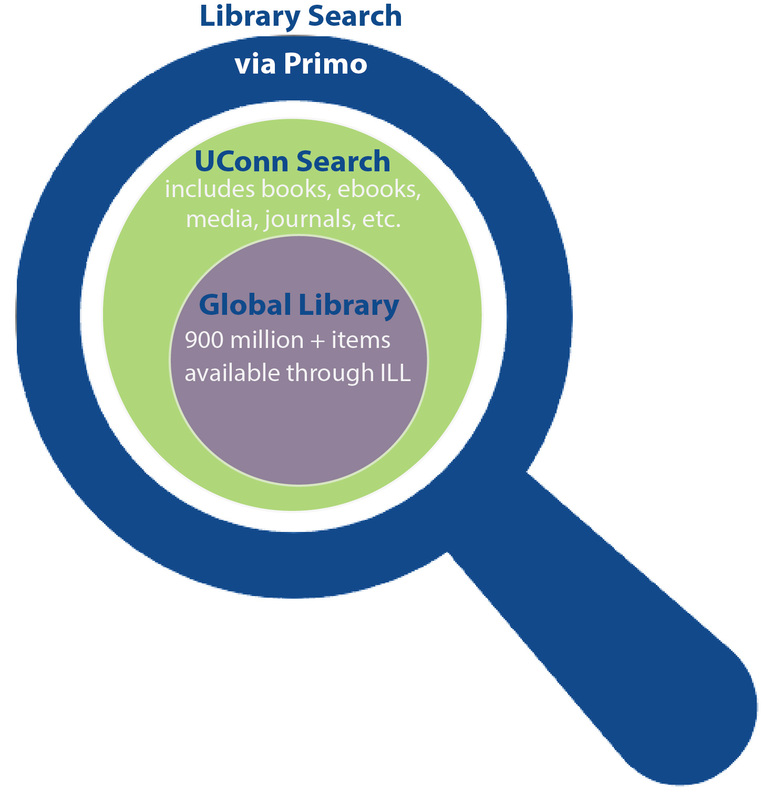 All of this is an effort for the UConn Libraries to make our collections easier for you to find as well as find ways to use our resources more efficiently during difficult financial times. If you have any questions or want to learn more, we suggest starting with our how-to guide. If that doesn’t quite answer your question, please feel free to Ask a Librarian or submit a comment and we will respond. Those planning “staycations” this summer, but wishing they had more adventurous plans on tap can easily be transported to other worlds by visiting this summer’s art exhibits at Homer Babbidge Library. On view are photos of such environs as Dingle Harbor in Ireland, Kerala in India, and Times Square courtesy of members of the Connecticut Valley Camera Club (CVCC) in their “Photography: a Passion” exhibit. Started in 2002, the CVCC is an active group that boasts 45 members with backgrounds as diverse as the photographs they create. 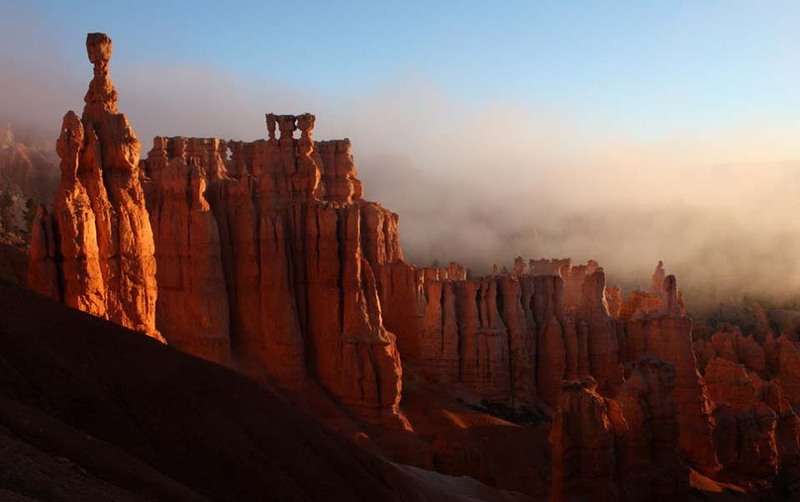 From architect, to molecular biologist, to flight attendant, to landscape architect, they are united in their passion for capturing sights that speak to them. This show represents the work of 11 members. 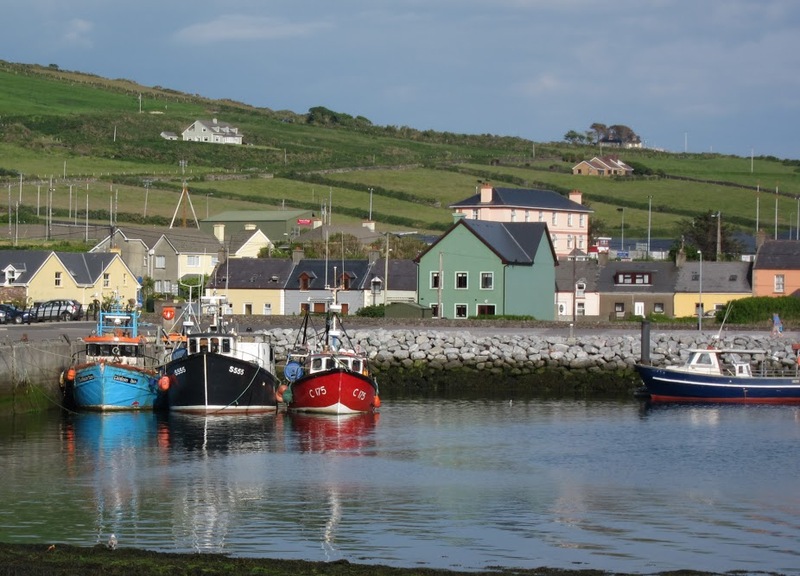 Dingle Harbor by Dean Rupp. Scientific illustrator Virge Kask treats those visiting her “Art in Science” exhibit to a visual feast found in the natural world. From Alaska to the Chesapeake Bay to the Central American rainforest, she has drawn inspiration for interactive critical habitat posters. 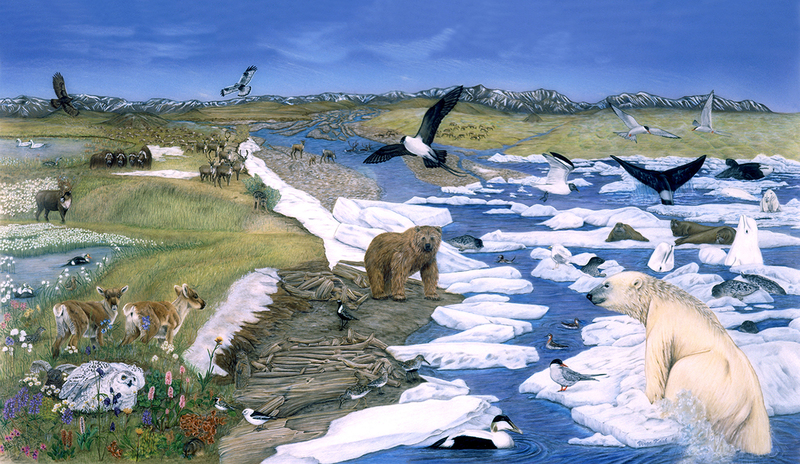 UConn’s resident science illustrator, Kask shows the wide range of work she’s done over past 30 years for journals, children’s books, educational posters, and museum exhibits. 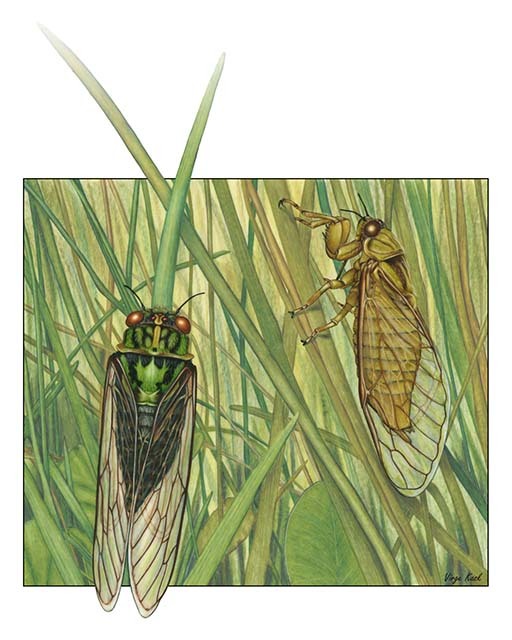 Virge Kask’s Grass Cicada Courtship. A public reception will take place on Thursday, September 10 from 4-6 p.m. The exhibits run through October 19. We are pleased to announce that the UConn Libraries will be a retention partner in the Boston Library Consortium’s Eastern Academic Scholars’ Trust (EAST) initiative. EAST is a major shared print initiative that includes 46 other member libraries across New England, New York and Pennsylvania. The idea is rather simple yet revolutionary – to ensure access to print items, such as books, journals and serials without every institution needing to have them in their libraries. The collaborative nature of libraries runs deep. The second law of library science introduced in 1931 by Dr. Ranganathan suggests that every member of the community should be able to obtain the material they need. Since every library is unable to own everything, this “law” is the premise behind why libraries already actively engage in services such as interlibrary loan, expanding access to electronic resources and are at the forefront of expanding the use of open educational resources. What is revolutionary about this initiative is the large scale effort to manage the materials collectively. When you add into the conversation the need for libraries, particularly those in an academic setting, to continue to adapt to changing landscapes in the way we research, teach and learn, we are seeing a strain on the balance between physical print collections and spaces that are high in demand. A shared stewardship of print materials among members of EAST will alleviate some of that pressure for space without compromising the need for preservation and access to scholarly works. We have been actively involved in this project which will begin with a collection analysis at each library, the development of a system to determine what the resources are that will be shared, decisions on who will retain them in their libraries and how we share them most efficiently and effectively. From our perspective, not only will this allow us to continue in our goals to collaborate at a regional level, but to also help us to get a full picture of the materials in our print collection. The timing couldn’t be better as we will also be able to utilize this information as part of the framework for a master plan for the Homer Babbidge Library, a project we are also embarking on this summer. The EAST project is being generously funded through the Andrew W. Mellon Foundation and the Davis Educational Foundation. The Mellon funding is to support the development of the sharing network and the Davis Foundation is funding the collection analysis which is estimated at over 20 million volumes. We look forward to being a part of this project as it moves forward over the next two years. We will be represented by Patrick Carr, Associate University Librarian for Collections & Discovery so if you have any questions please feel free to contact him. For a more detailed look at the project, please see the BLC Website.